PS. I’ll be there, too. Kim Hudson of Fox2 News joined us to have fun and give this a shout out. Hope you will as well…ballet steps are all the rage for a wonderful way to exercise. Vanessa Woods teaching Vitality Ballet. Pratt + Kreidich Photography. “What a wonderful way to hear our favorite…Oklahoma!” ~ M.P. “Thank you for a beautiful morning.” ~ J.H. Hope you were in our audience. If you couldn’t make it, please save Wednesday morning April 3 for MPAC! The Missouri Pageant Alumnae Club (MPAC). These Award winning, talented, and gorgeous gals are state & US. pageant award winning singers, dancers, baton twirlers, piano players. in making these programs happen. The Silver Stage Senior Theatre program by Stray Dog Theatre presents an annual production, featuring a cast of actors exclusively over the age of 55 years old and a production team largely composed of professional and pre-professional young adult artists. The next production will be William Shakespeare’s Macbeth in May 2019. Silver Stage hopes to provide the experience of theatre to older adults, regardless of ability, age, experience, or background, and create a network of mature performers who can become an active and vibrant part of our theatre community for years to come. Auditions for Macbeth will be held Saturday, January 12, 2019. As always, Stray Dog Theatre honors diversity and non-traditional casting practices. No experience is necessary! Whether you’re a seasoned actor or a first timer, we want to work with you. Anyone aged 55 and over who can provide their own transportation to and from rehearsals and performances and are interested in theatre can audition! Read on through the link below…this makes me proud of where I am in life and what I hope to have to look forward to. You, too? We promise you and your friends will ♥ love ♥ this! The Missouri Pageant Alumnae Club (MPAC) will lead off our holiday season. Award winning, talented, and gorgeous gals are state & US. pageant award winning singers, dancers, baton twirlers, piano players. Come join me in the fun and celebrate the season with Joy! 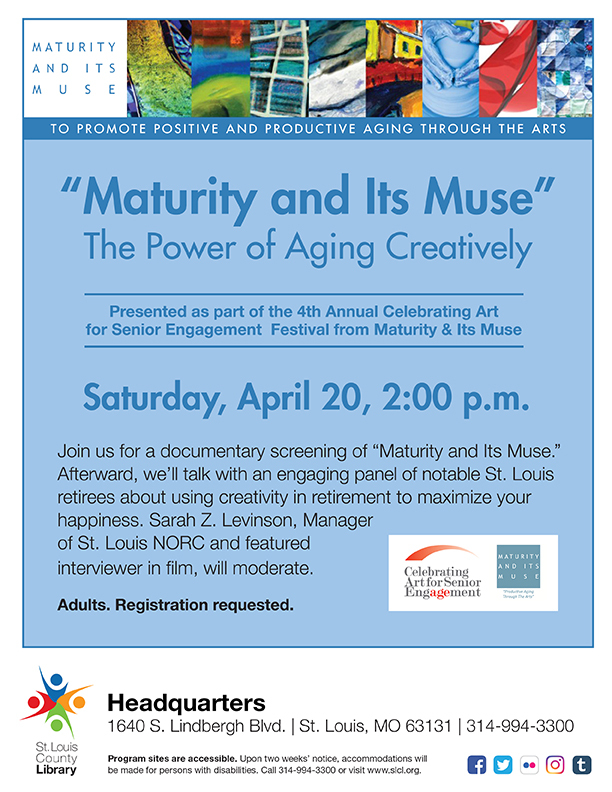 Maturity and Its Muse gratefully acknowledges the support of the Delmar Gardens Family in making this program happen.